WE stood in the sun in Castlebar last Sunday and looked towards the heavens. Not since the days of the legends – Sean Flanagan, Padraig Carney, Paddy Prendergast and their comrades – had we won four Connacht titles in a row. The famous pitch on MacHale Road was awash with the green above the red as Andy Moran lifted the Nestor Cup towards the sky and Mayo people all around the world celebrated the county’s 45th provincial title. The victory had been expected, the win wasn’t a shock, but there had been a sneaking suspicion that Galway might upset the best laid plans with a performance full of vibrancy and verve, but that theory never took flight. Mayo won as they pleased really. Galway made a burst just after half-time and created a few goal chances but Mayo settled to their task once again and it wasn’t long before hundreds of young fans were massing behind the goal at the Bacon Factory End waiting to race onto the pitch to acclaim the history makers. The seven-point gap at the end was about right. Mayo were never in bother but never too far ahead either and the final score reflected that perfectly. The Green and Red were much-improved from their earlier outing in Hyde Park, but Galway weren’t nearly as skilled in defensive play as the Rossies and this allowed the champions play with more swagger than they had exuded in the semi-final. Galway tried to play a blanket defence early on with corner-forward Danny Cummins often left to forage by himself in the Mayo half of the pitch, but this didn’t prevent the home side building up an early lead and the Maroon and White reverted to more traditional fare in the second period. Neither tactic was good enough to win the game and while the Galway men clipped over eleven points in the second period they also conceded 2-5 in that time and were beaten long before the end. 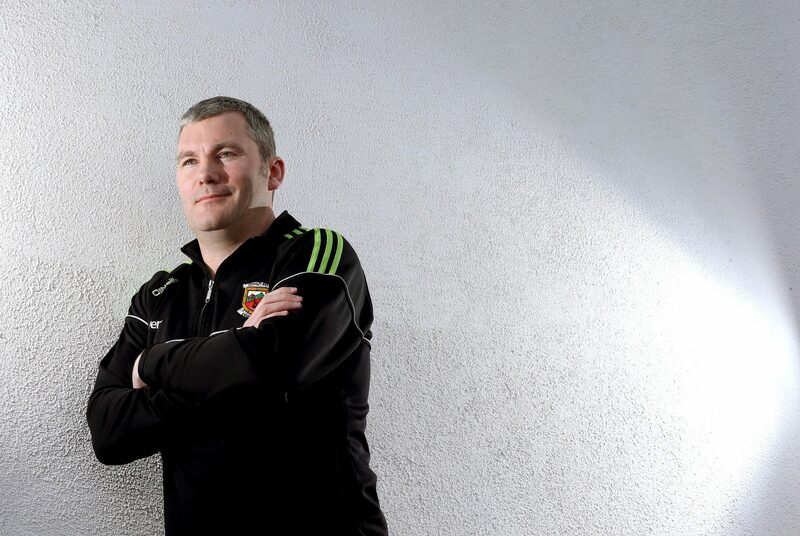 Mayo lined out with Aidan O’Shea at centre-half-forward and he had an excellent day, winning a huge amount of ball and using it intelligently for the most part. Barry Moran and Seamus O’Shea enjoyed a very good first half, and it can be said that Mayo had the better of the exchanges in the middle despite Moran being black-carded in the final quarter. The defenders were more than adequate for the opening half with Keith Higgins, Donal Vaughan and Colm Boyle to the fore, but they won’t be happy with the concession of so many points in the second stanza, while the forwards looked much more inventive and exciting than in recent times. Shane Walsh kicked the opening point of the game after just a few seconds but the Tribesmen would only add another four to their tally before the halfway mark despite the best efforts of spring-heeled wing-forward Micheál Lundy, while Mayo kicked 1-9 in the first 35 minutes. The excellent Cillian O’Connor had five to his name by the short whistle while the sprightly-looking Kevin McLoughlin had raised three white flags in that period. The Knockmore man was having his best game for some time and his points were things of beauty. Alan Dillon had weighed in with a single and the goal from Lee Keegan after 23 minutes was a tribute to fine team-play. Chris Barrett plucked a ball from the sky in the right corner of the defence. Ger Cafferkey, Colm Boyle, Barry Moran and Andy Moran worked it down the pitch to O’Connor in the right corner of attack. He cut in along the end-line and flicked it into the path of Keegan for the Westport man to touch it into the net. Galway almost had a goal of their own in the first 12 seconds of the new half when Shane Walsh burst through and almost sent the crossbar out to Parke and Paul Conroy had another sight of goal two minutes later but both men had to be happy with points, which added to one from Gareth Bradshaw drew the challengers to within five of the champions. That was as close as they would get. Mayo streaked up the pitch. Boyle sent Keegan racing through and when he was hauled down only those with a degree in referee-engineering could give any insight into why a penalty wasn’t awarded. That didn’t halt the holders and Jason Doherty kicked a point, O’Connor added another before Keegan tried to remodel the crossbar at the Albany End after a peach of a pass from McLoughlin. That was the prelude to a Mayo goal after 48 minutes when Andy Moran and Seamus O’Shea sent Doherty racing through and he showed excellent style to hit a shot low and hard to the net to leave the Green and Red 2-12 to 0-9 clear and eyeing history. At the other end Shane Walsh continued to kick frees and Sean Armstrong and Paul Conroy also troubled the umpires but the tepid response from the travelling support gave an indication of their chances. The guests were left further adrift after 56 minutes when a pass-the-parcel attack involving O’Connor, Barry Moran and Keegan took the ball through the Galway back line for the big Castlebar midfielder to box the leather to the net. Three minutes later the goalscorer was headed for the sideline having been black-carded for pulling down Conroy and a penalty was awarded. The Galway fans sensed a comeback but Shane Walsh’s penalty was saved brilliantly by Robert Hennelly low to his right and all hope was gone. The last few minutes were just an exercise in running on subs and getting to the finish line as history beckoned and the heroes of yesteryear were being joined by a group of men with four Connacht titles in a row and the dream of bringing Sam back to the Plain of the Yew Trees still burning brightly in their chests. The task of writing their names in provincial history has been achieved. Now it’s time to cross the Shannon and set our eyes on the biggest prize of all. The great adventure is once again taking shape and we’re all going along for the ride. Subs; Michael Conroy (for Dillon 42), Alan Freeman (for A Moran 51), Jason Gibbons (for B Moran 59), Kevin Keane (for Boyle 67), Diarmuid O’Connor (for Doherty 68), Mike Sweeney (for A O’Shea 70). Subs; James Kavanagh (for Comer 24), Daithi Burke and Sean Armstrong (for Tierney and Cummins 42), Greg Higgins (for Hoare 54).